The „Pull Up“ sketch is of course more interesting than the previous high Z sketch. All LEDs light up. But not equally bright. Most are pretty dim, LED 13 is very dim and LED 0 is brighter than all the rest. But why? The sketch enables the pullup resistors. Then all Arduino pins will be internally connected to 5V through a 10-47k resistor. This is enough to light them up but very dim though. 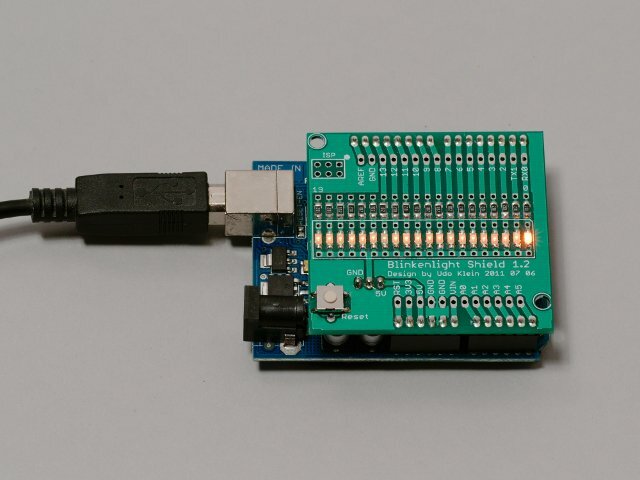 Pin 13 has an additional LED connected on the Arduino board itself. Hence LED 13 gets less current than all the others. As we already found above LED 0 is driven by the serial interface. Thus it gets significantly more current than all the others. Hence it is much brighter. With the next sketch we will pull all pins to low. Although this seems boring there is something to learn.